The organ was repaired and prepared for its future use as a teaching and concert instrument by Dominic Gwynn in 2013-4. The purchase of a historic Dutch chamber organs for the use of the music department of a British university is most unusual; Eton College is the only other institution in the UK with an organ in this style. It may have originated in the workshop of Hendrik Hermanus Hess, of Gouda, the most prolific builder of domestic organs in the Netherlands in his day. It was originally made in the manner of Hess’s bureau organs, with perhaps a 2vt front and carved panel above the keys. 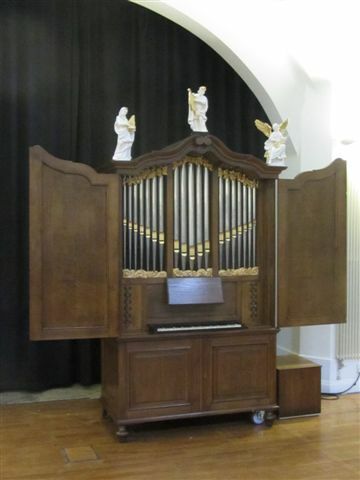 These organs share characteristics: wind chest placed low, with a single fold horizontal bellows underneath and splayed stickers between the pallets and the keys, ranks divided bass and treble with a stopped oak Holpijp 8vt. The organ may have been made in around 1780. According to A.J.Gierveld’s Het Nederlandse Huisorgel in de 17de en 18de eeuw (Utrecht 1977) the key compass of these small organs expanded to C – f³ between about 1770 and 1790. In 1970 the firm of Verschueren restored the organ for the Roman Catholic Cathedral in Utrecht, with a new case. It had lost its original casework and was probably not in good condition, since there have been extensive repairs on the wooden pipes, and some of the treble ranks have new pipes. In 2011, the organ was sold to Firma Feenstra of Grootegast in Groningen (in the north east Netherlands), and he sold it on to Ed Wijnands, retired minister, of Dalmsholte in Overijssel. In 2013 the organ was sold to the Music Department of Liverpool Hope University, by the agency of Dr Tassilo Erhardt. The tremulant had stopped working and leaked wind, so it was removed. The conveyancing to the 1970 front pipes prevented tuning of the upperwork, also removed so the front pipes are now non-speaking. The oak case has been stained darker and Dr Erhardt has bought three carved and porcelanized lime carvings, of King David, St Cecilia and a musical angel. In ca1780 there would have been a tremulant on the wind trunk.